It appears that next month's Professional Game Board meeting at Twickenham will consider an RFU proposal to introduce a play-off in May 2019 between the bottom team in the Premiership and the top team in the Championship, with the winner being guaranteed a place in the Premiership for 5 years. During that period there would be no relegation - thus allowing Premiership clubs a degree of financial stability. Of course, the ramifications for the losing team in the play-off would be huge - no prospect promotion to the Premiership for 5 years would make attracting sponsors, backers and players extremely challenging and I guess there will consequently be an inevitable widening of the commercial gap between the haves and the have-nots. Although that does seem a little harsh - and the likes of London Irish are probably more than a tad concerned at the prospect - ultimately something had to be done to address the fact that (as I've stated on more than one occasion) that there simply isn't enough money in club rugby in England to sustain 2 fully professional leagues of 12 teams. Whether this proposed solution is the right solution is debatable and I would have thought that it can't be beyond the wit of man to devise a format to accommodate all of those teams who have the structure and financial wherewithal to operate successfully as a professional rugby club. 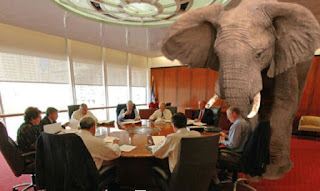 That said, at least it looks as if this particular elephant in the room is finally being addressed.